Ecotourism and sustainable trophy hunting have delivered verifiable conservation benefits in parts of Africa, but scaling up has proven difficult. Now, an innovative pilot scheme in Tanzania is trying an alternative approach: paying communities directly to protect wildlife habitats. The Ecosystem Marketplace examines this promising new model for wildlife conservation. 16 July 2008 | The stone patio at Tarangire Safari Lodge sits on a bluff overlooking the Tarangire River, where thousands of elephant, buffalo, zebra, and antelopes congregate during the long Tanzanian dry season. During this time of year the lodge – easily the best vantage point for miles around – is packed with tourists from Europe and North America enjoying evening cocktails as they watch families of elephants drifting down to the river in the fading light. Such spectacles have made Tarangire National Park one of the jewels in northern Tanzania’s tourism circuit, and a key part of an industry which generates over $800 million in total annual revenues in one of the world’s poorest countries. Such funds should, in theory, provide an incentive for the people of the plains to conserve wildlife, but there’s a catch: the money historically flows primarily to tourism companies and national park agencies, while the wildlife herds roam widely according to seasonal patterns of rainfall and forage availability, living for up to half of the year outside the park on community lands. If the animals’ habitat is to be preserved, benefits will have to flow to people far away from park boundaries and tourism lodges – but how? Some other regional efforts to pay for habitat services have failed to provide a direct link between conservation and payment – and thus failed to make a difference. Now the Tarangire Safari Lodge and a small group of other tourism companies which are invested in the park and surrounding area believe they’ve found an answer, and have entered into an agreement with Terrat village, which provides the community with annual payments for protecting important seasonal wildlife habitats. Although Terrat lies about 40 kilometers from the park boundary, its lands contain critical breeding and calving grounds for thousands of wildebeest and zebra that spend the dry season along the Tarangire River. “At the end of the day, our industry’s sustainability depends on these communities having a secure economic stake in the health of the wildlife populations that their lands help produce,” says David Peterson of Dorobo Tours, the company that took the lead in negotiating the deal with Terrat. East African savannahs are lands where change and variability are intrinsic ecological characteristics. In these semi-arid areas, rainfall largely determines annual plant growth, but rainfall is in turn rather unpredictable. For wildlife and human communities alike, these conditions place a premium on the ability to move across large areas to take advantage of the ephemeral presence of water and forage. When the rains do fall across the Maasai Steppe, which usually occurs some time in October or November, the scene along the Tarangire River changes dramatically. Wild animals soon depart from the park’s confines, dispersing far and wide to areas which lack permanent water but which bloom with fresh new growth once the rains arrive. “During the rainy season, the park has very few animals remaining within its boundaries,” notes Charles Foley, a zoologist with the Wildlife Conservation Society and researcher based in Tarangire since the early 1990’s. Herds of zebra and wildebeest, the most abundant large mammals in Tarangire, travel to wet season habitats on open short-grass plains. These plains, formed by a hard underlying rocky substrate covered with a layer of volcanic soil, possess mineral-rich grasses which wildlife require during the calving season because of the value such nutrients provide to lactating female animals and their young. The most important area for Tarangire’s herds is an expanse of open grasslands known as the Simanjiro plains, located between 25 and 40 kilometers to the east of Tarangire National Park. These plains hosted about 10,000 zebra and 6,000 wildebeest in the early 1980’s, in addition to smaller numbers of antelope such as eland, fringe-eared oryx, Grant’s gazelle, and hartebeest. Today, perhaps only 3,000 to 4,000 zebra and wildebeest in total are found on Simanjiro, and species such as oryx and hartebeest have become scarce. These declines are due to high levels of poaching for meat and zebra skins, combined with the loss of habitat to spreading agriculture. The Simanjiro plains fall under the traditional authority of several Maasai communities, the pastoralist ethnic group that inhabits much of the Rift Valley from central Kenya to central Tanzania. The Maasai are renowned for living amidst some of the world’s greatest assemblages of wildlife, and their pastoralist management practices – burning and grazing rangelands and preventing cultivation across large areas – have shaped ecosystems such as the Serengeti over the course of the past two or three centuries. Maasai pastoralist management systems mirror the basic ecology of wild herbivores in these savannahs in moving between dry season and wet season pastures. Maasai communities set side large areas of their land as customary grazing reserves, where livestock are only allowed to enter and graze during the later stages of the dry season. This ensures the availability of forage during this most difficult time of the year. It also effectively protects large stretches of land free from human use for much of the year, which helps conserve wildlife populations. The Simanjiro plains fall within the boundaries of three villages: Emboreet, Terrat, and Sukuro. While these communities, like Maasai elsewhere in northern Tanzania, may co-exist reasonably well with most large mammals, save the occasional lion or hyena that attacks livestock, their relationship with conservationists has been far less amenable. In 1970, the creation of Tarangire National Park displaced local people and permanently closed off access to the important water sources – the Tarangire River and large swamps in the park’s southern portion – located in this new state protected area. Twelve years after Tarangire National Park was gazetted, a proposal was put forth by a foreign conservationist to create a new ‘multiple-use’ conservation area on the Simanjiro plains in order to protect this key stretch of habitat. This proposal called for banning all agricultural cultivation and reducing livestock numbers in Simanjiro across a 6,000 square kilometer area. The reaction by local communities was, unsurprisingly, defensive and antagonistic. Two decades later, the legacy of historic experiences, compounded by additional efforts to create new parks, reserves, and ‘buffer zones’ adjacent to Tarangire, has made local communities extremely suspicious of conservation interests. Recent research findings demonstrate how some Maasai communities are now promoting farming not only out of food security interests, but also because they feel that agriculture ‘brands’ the land and makes it harder to take away for conservation purposes. “The fear of wildlife conservation interests plays a significant role in the spread of agriculture in Simanjiro’s pastoralist communities,” notes Hassan Sachedina, who recently completed a PhD dissertation at Oxford examining the interaction of livelihoods and conservation in Emboreet village. This creates quite a challenge for landscape-scale conservation in the community lands outside Tarangire. Although wildlife populations depend on lands far outside national park boundaries which are managed by rural communities, those communities have generally grown hostile to formal conservation interests as a result of land and resource loss during the past thirty years. Furthermore, wildlife remains government property in Tanzania, generating large revenues from trophy hunting which is predominantly captured at the national or district level but rarely trickles down to villages. This lack of positive local incentives for conserving wildlife on community lands underlies the declining wildlife populations in Simanjiro, and, for that matter, across much of east Africa. One promising model for generating such incentives emerged in the early 1990’s. Two relatively small-scale, high-end tour operators, Dorobo Tours and Oliver’s Camps, approached communities living adjacent to Tarangire National Park with the aim of exploring the possibility of establishing tourism concessions on community lands. The operators’ objective was explicitly geared towards linking conservation with tourism enterprises in order to provide local incentives to protect land for wildlife rather than allow it to be converted into farms. “Our goal was to make wildlife and tourism a viable economic option for the communities and shift their incentives away from the growing threat of agricultural conversion,” recalls Peterson. These initial negotiations led to formal agreements between the operators and two villages, Emboreet and Loiborsoit, providing the communities with set annual concession payments augmented by daily fees paid for each client staying in the area. In exchange, the villages gave the operators exclusive tourism rights to the tourism concession areas and agreed to prohibit farming, permanent settlement, and tree-felling for charcoal production. An important part of the agreement was that seasonal use of the concession areas for livestock grazing continued to be allowed according to customary practices. Since the early 1990’s, several other village-operator tourism concessions have emerged, and these areas now provide community protections of about 40,000 hectares of land along the eastern border of Tarangire National Park. Although these tourism ventures provided the incentive to for local communities to protect a large area of land adjacent to the park, the more important wildlife habitats on the Simanjiro plains, much farther away from the park, were not included in the concessions. In fact, the plains become difficult to access by vehicle during the wet season, when the large herds of wildlife are present, and are not as attractive for tourists during the dry season, when they are accessible. The plains’ value to tourism is mostly indirect, by providing the wet season habitat for wildlife that congregates inside Tarangire National Park during the dry season, and which lend the park its high value for tourism during this time of year. This situation represents a classic market failure: wildlife with an overall high economic value does not, through the existing operation of tourism markets, provide any remunerative value to the communities whose lands provide the habitat that these animals depend on. For example, Terrat and Sukuro villages’ lands contain about two-thirds of the Simanjiro plains, but they receive no income from wildlife tourism. This market failure served to catalyze a new approach for rewarding local communities in Simanjiro for the ecological services they provide by maintaining critical wildlife habitat. “After 25 years of watching wildlife populations decline and millions of dollars be spent on conservation projects that were, for the most part, ineffectual, it seemed like time to think and act outside the box,” says Peterson. A consortium of five tourism companies, supported by conservation organizations including the Wildlife Conservation Society and Sand County Foundation and a local development organization called the Ujamaa-Community Resource Trust, experimentally decided to pay one of the Simanjiro villages, Terrat, to formally protect its portion of the short-grass plains. Terrat receives a modest annual payment, the equivalent of about $4,500, in exchange for contractually agreeing to prevent farming or permanent settlement on about 9,300 hectares of land which encompasses its portion of the plains. The village is also contractually obliged to prevent activities such as charcoal burning, tree-felling, or illegal hunting of wildlife. Unlike nearby tourism concessions in other villages, in Terrat the tour operators do not carry out any tourism activities in this concession area; their payments are made solely out of conservation aims, and based on the reality that tourism businesses inside Tarangire National Park rely on the health of the wildlife populations using the Simanjiro plains. Instead of buying access to community land for tourism, the operators are buying protection of the land and its value to wildlife directly. 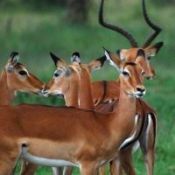 This land easement or conservation concession is the first of its kind in Tanzania, with only one or two similar arrangements having been developed elsewhere in east and southern Africa’s wildlife-rich savannahs. Both the operator consortium agreement and the easement contract with Terrat village were negotiated principally by Dorobo Tours. The company’s long-term experience with community tourism concessions provided critical background experience for the deal’s successful execution. A key challenge which needed to be overcome was the historic local suspicion of wildlife conservation interests. “The key to making the easement acceptable was presenting the deal to the village as a business proposition linked to system-wide tourism interests, and not making the deal about ‘conservation’ per se,” notes Peterson. This novel arrangement has only been in place for about three years, but it has given new hope for developing collaborative solutions to the long-term conservation challenges in the Simanjiro plains and broader ecosystem. The most important impact has been providing a framework for creating local financial incentives for conserving wildlife that does not depend directly on the physical presence of tourism camps. This payments-for-conservation model could, for example, be more widely adopted by large conservation organizations and foreign donors, or by government park authorities. Moreover, this model has been established in a locale that has long had a deserved reputation as a crucible of conflict between local communities and conservation interests. By making conservation a fair deal for communities and rewarding them for the value their lands provide, a step has been taken towards a more effective and equitable approach to wildlife conservation in northern Tanzania. Fred Nelson has worked on community-based natural resource management in Tanzania since 1998 and is the director of Maliasili Initiatives, a consulting firm which promotes innovative conservation strategies based on local incentives and devolved resource tenure. He can be reached at fnelson@habari.co.tz. Part Two: How Much for this Mountain Forest? ← Pennsylvania Water Deal: Blip or Boom?